One of the most beautiful parts of the Christmas season holiday celebrations is the tradition of an Advent calendar. Many people have adopted this tradition whether or not they are aware of the origin of the Advent calendar. Advent calendars add to the anticipation of the holiday season, and they add to the fun for children and adults as we count down the days until Christmas. Although Advent calendars originally began in the German Lutheran movement in the 19th century, they have become a tradition for many Christians, both religious and secular, as a way to extend the beauty of the Christmas season, expecially for children. What child does not like to count down the days before Christmas, as well as open a door to a surprise each day leading to the holiday? Advent calendars are now available in many styles and materials. Some are paper like regular calendars, while others are made of cloth. But in my mind, the most interesting Advent calendars are the wooden Advent calendars. 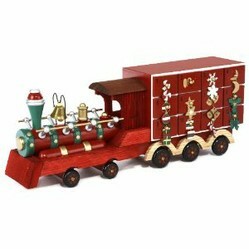 These are lovingly constructed out of wood, and show off the magical wonder of the Christmas holiday, as you appreciate both the imagination of the artist, and the construction of the calendar. As I searched for a selection of wood Advent calendars to display on this article, the most wonderful calendars I came across were made by Kurt Adler. The Kurt Adler calendars come in several styles, both 2D and 3D. The 3D wood Advent calendars are the most fun, and the most whimsical and magical, because there is just so much more room for creativity when you work with 3 dimensions, however the 2D calendars are also delightful. As you browse through the various selections, both on this page and as you click through to see more calendars, you will be astonished and amazed at what can be done with a little inspiration. These wood Advent calendars will truly capture your imagination even if you are an adult. These are not just for children, oh no. Adults will fall in love with them too. 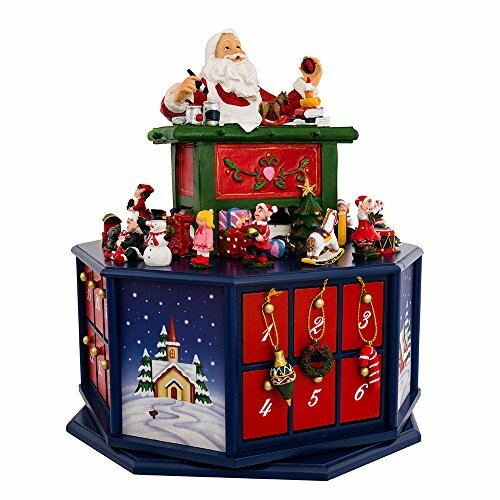 The Christmas season is inundated with sounds and music, and you can also find wood Advent calendars that have both music and animation. These add another dimension to the magical nature of Christmas, and make the Advent calendar an interactive toy as well as a countdown to Christmas. 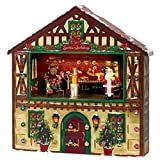 Many of the wooden Advent calendars have religious scenes, such as the Nativity scenes, while others depict the more whimsical side of Christmas with scenes of toy shops, or Santa's activities in the workshop or delivering the gifts for Christmas. While Kurt Adler is my favorite wooden Advent calendar maker, there are several other companies that produce wooden Advent calendars that are wonderful gifts for any children that you have in your family. Some of the calendars come with magnetic attachments to keep the calendar together, and help from losing any of the parts. You can also buy Advent calendar kits to finish your own Advent calendar, adding personal touches such as names of family members or details that relate to your family personally. If you have artistic ability, these make a unique gift that no one else will have, a one of a kind treat for your family. If you are not artistic, don't worry, because you can appreciate the artistry of other Advent calendar makers including Kurt Adler, Fontanini, Byers Choice, and eeBoo. Advent calendars are a beautiful tradition loved by adults and kids in order to count down the exciting days until Christmas. Building Blocks are lots of fun for the young ones. Not only do they offer countless hours of entertainment - but they also help develop many skills, which are of use at school and throughout life. Yes, children do break things. My daughter is a champion of breaking unusual items. I am a huge fan of Wooden Advent calendars. Wooden Advent Calendars are great because I can use them every year so long as my children don't break them. Lovely. I have never heard of these Advent calenders. But, since I am an affililiate marketer, I am going to look into them some more. They've lovely, but every time someone mentions an Advent calendar I think of Bad Santa. Wicked funny. These Advent calendars are wonderful! I've always enjoyed using an Advent calendar, but I've never used a wooden one.